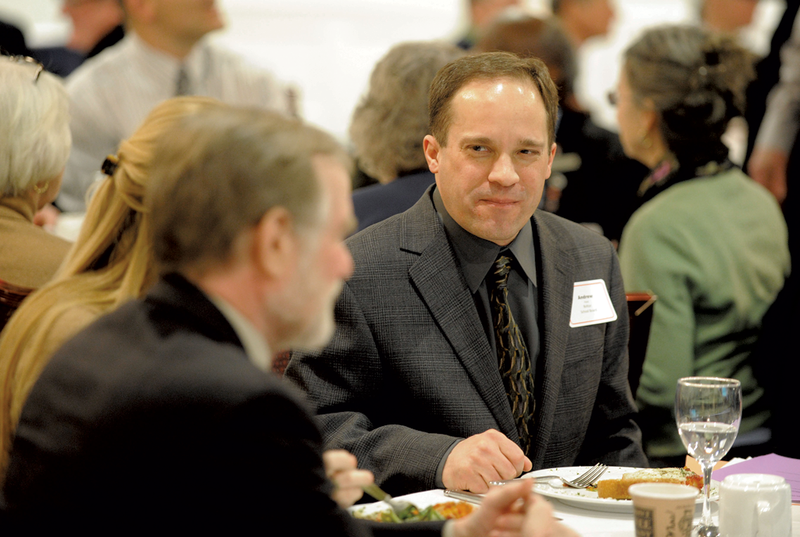 Bolton school board member Andrew Pond lunching with House Education Committee chair Dave Sharpe in Montpelier. Four days a week, Andrew Pond dons a sport coat and drives 30 miles from his home in Bolton to the Statehouse in Montpelier. Pond has been on strike from his job as a service representative at FairPoint Communications since last October. He spent time on the picket line, caught up on errands and then decided he needed "more structure." As a Bolton school board member and father of two, 48-year-old Pond decided that the best way to spend his idle time was to follow the debate over the future of Vermont's schools. He spends most weekdays sitting on a padded bench in the House Education Committee's cramped meeting room on the second floor of the Statehouse. For the past few years, Pond's town has been confronting the very issue the legislature is now debating: What can government do to slow rising property taxes as enrollment in Vermont's schools continues to shrink? In November, Bolton answered that question by merging into a school district with nearby Richmond, Jericho and Underhill. The question now is whether legislators should lure, nudge or mandate communities across the state to do the same. Answering that question will force Vermonters from Bakersfield to Wilmington to consider whether they can afford to stay small. Last Thursday, House Education Committee chair Dave Sharpe unveiled draft legislation that would merge Vermont's 277 school districts into far fewer, larger districts. The bill gives districts until 2018 to reconfigure themselves and meet education standards, but failing that they would be forced to consolidate. Small school grants and "phantom student" subsidies that have been a lifeline for the most rural Vermont communities would be eliminated, according to the bill. With rising property taxes hanging overhead, Vermont could be on the verge of changing the definition of "local" schools. Consolidation makes sense to Pond. When his son started at Smilie Memorial School in 2004, the school had a total of 25 kindergarteners. Last year and the year before, the fourth grade at Smilie had just nine students, Pond said. As Bolton's enrollment shrank, taxes rose, residents rejected the budget and the school board was forced to make deep cuts. Last November, four of the five towns that make up the Chittenden East Supervisory Union — including Bolton — voted to dissolve their elementary school boards and merge into a single district, which would be governed by one 15-member board. Pond is a member of that new board. "I have a much higher degree of confidence that, as part of this larger district, Bolton will retain a better quality of education than they might have," Pond said. Not everybody has such confidence. A fifth town in the union, Huntington, rejected the merger and decided to retain its local elementary school board. Last week, several Huntington residents traveled to Montpelier to offer the House Education Committee a different perspective. They argued there was no evidence that merging would save money or improve education. Rather, they said, Huntington would lose local control of the town's Brewster Pierce Memorial School. "I don't believe we should change the definition of what a community is," said Gail Conley, a retired school superintendent who lives in Huntington. Other small-school supporters were so fearful that their voices were being drowned out that they formed an advocacy group, hired Montpelier lobbying firm Action Circles and are trying to make the case that smaller can be better. "There are some strong merits to small schools," said Chris Tormey, a member of the group that calls itself Vermonters for Schools and Communities. He's a school board member in Cabot, which operates a prekindergarten-12 school with roughly 200 students. Students there are heavily involved in extracurricular activities, have strong test scores and take advanced-placement courses at a higher-than-average rate, he said. Cabot has only one science teacher, Tormey told the Senate Education Committee last week. That's good, he argued. In a small school, students and teachers get to know each other well. Committee chair Ann Cummings (D-Washington) came to the opposite conclusion. "I get concerned if there's only one science teacher in a school," she said later. "I think it's somewhat idealistic to say every kid is going to do well under one teacher." The debate over school consolidation is hardly new in Vermont. Last week, as the Senate committee discussed the issue, Sen. Bill Doyle (R-Washington) pulled out a 1968 report he authored on the topic. The state had 283 school districts then. It now has 277. The debate was reinvigorated last March when 35 school districts voted down proposed budgets. In November, voters appeared to vent their frustrations over rising property taxes by opposing Democratic legislators and Gov. Peter Shumlin. The former lost seats in the House and Senate, while the latter nearly lost reelection. "I was one of those people who knocked on doors and heard about property taxes," said Sharpe, whose Democratic district-mate, Mike Fisher, was defeated by Republican Fred Baser. "We have to do a better job. We can't just spend more money." The House and Senate are working together on the topic in a way that eluded them in previous years. "That's what happens when you have an election that sends such a big surprise as the last one," said Senate Majority Leader Philip Baruth (D-Chittenden). "There is going to be something major done this year." "Something major" could include further shifting the cost of education from property taxes to income taxes. Proposals to accomplish that are still emerging. But lawmakers and the Shumlin administration are focusing much of their attention on whether Vermont can afford so many school districts. It's clear that small schools will increasingly have to prove their worth. Education Secretary Rebecca Holcombe has produced data demonstrating the real cost of small. When people see those costs, she argued, they might make different decisions about their schools. Holcombe has asked legislators to phase out small school grants, which go to schools with fewer than 100 students or an average grade size of less than 20. She also hopes to decrease so-called "phantom student" subsidies, which protect schools from a decrease in funding should enrollment dip by more than 3.5 percent. By counting "phantom students," schools effectively pad their enrollment in order to retain funding. Holcombe has also proposed requiring schools to meet standards that take into consideration per-pupil spending and student-teacher ratios. Small schools with high per-pupil spending that are unable to meet sufficient standards would be particularly targeted, Holcombe said. If a school doesn't make the grade, Holcombe wants the State Board of Education to intervene and even close those that can't — or won't — make improvements. "The reality is none of us want declining enrollment. It is the hand we're being dealt," Holcombe said. "We all have to make choices." The state is paying $7.5 million in small school grants this year. Cabot, for example, received one for $163,156. The district also counted 15.4 phantom students. Take away both the grant and the phantom student subsidy, and Cabot's equalized tax rates would soar from $1.579 to $1.872 per $100 of assessed value. Taxes on a $250,000 house could go from $3,847 to $4,680 with no adjustment for income. Sharpe agrees that showing the real cost of small schools is an eye-opener. The town of Addison opted against merging with neighbors, he noted, but if residents faced a tax rate that reflected the real cost of educating their children, they might have chosen to merge. "Why are we incentivizing small schools not to do what is best for their students?" Sharpe asked. Those receiving small school grants see things differently. They consider the grants part of the deal struck when the state adopted Act 60, the 1997 law designed to equalize education across the state, said Vermont School Boards Association executive director Steve Dale. One-third of his member boards receive small school grants. Rep. Heidi Scheuermann (R-Stowe) called the elimination of small school grants a "passive-aggressive way for the state to close schools." Tormey said losing the small school grant would force Cabot to make significant cuts. "My concern is that some of the very large strengths of a school like Cabot and other small schools would likely be lost," he said. Susan Clark of Middlesex, another member of Vermonters for Schools and Communities, told the House Education Committee that small schools are what make Vermont communities special. "Local is probably the single thing Vermont does best," she said. "There are other states that are desperate for what we take for granted." In Bolton, Pond said his perspective on "local" changed as his school board looked at its options in recent years. "I began to realize what I thought of as 'we' was changing. 'We' was no longer Bolton. I began to realize 'we' was Chittenden East," he said. Under state law, schools in a newly merged district are protected from closure for the first four years. While there are no guarantees after that, Pond said he thinks the merger creates options other than elimination. Smilie, which is the smallest school in the newly formed district, could become a magnet school or a pre-K-3 school, he said. House Speaker Shap Smith (D-Morristown) said reality dictates that declining enrollments mean school closures are likely — regardless of what the legislature does. "Schools are going to close in the state of Vermont whether we put some sort of mandatory closure language in there or not," he said. "The pressures that they're feeling mean some of those schools are going to close." In the last month, legislators have sifted through more than 100 ideas submitted by members of the public about how to improve the state's education system. "An overwhelming majority of recommendations and testimony in this building, and a growing sense among legislators, is that we have to look at larger school districts," Sharpe said. "There are probably 50 ways to do that." The bill he unveiled in committee last week proposes to do so by requiring school districts to come up with their own reconfigurations by 2018. Failing that, they'd be forced to merge along the lines of the state's current 67 supervisory unions. Sharpe said that falls somewhere between voluntary consolidation, which most communities ignore, and mandatory consolidation, which scares many of them. "We have to find a path in between that allows local input," Sharpe said. Cummings, his Senate counterpart, agreed. It's also clear, though, that at some point the state would step in with a hammer. "I'd like to allow districts some flexibility," Cummings said. "My preference would be to give them some very definite goals we expect them to achieve. If they don't, we may have to step in." That could be a tough sell. "It's going to cause a big ruckus," Scheuermann said. "I would prefer things be brought back closer to local communities." She proposes a plan that would create 15 regional unions. Within them, decisions and spending would be controlled locally. So far, her plan has gained little traction. When Holcombe presented the Shumlin administration's education agenda to the House committee two weeks ago, 27 visitors crammed into the room to listen. 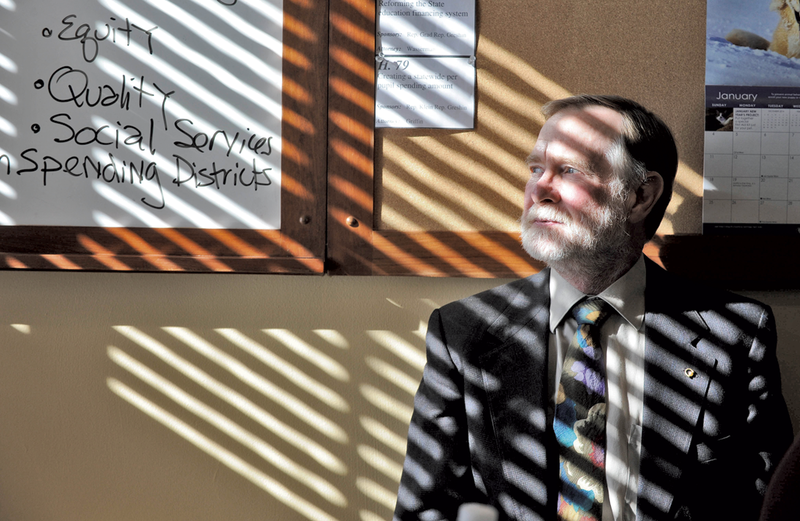 "I'm glad to see education's finally getting the attention it deserves," Holcombe joked. Joel Cook, who represents the Vermont-National Education Association teachers union, was among those squeezed into a corner. In 23 years following education issues in the Statehouse, he's seen a lot of ideas fail. "I've seen all of it, and most of it more often than once," Cook said. "It gives me some measure of insight about the practicality of some of the ideas." "Our primary interest is in insulating our children and teachers in the classroom," Cook said later. Unlike Cook, Pond is a newcomer to the Statehouse, but he already blends in. He learned early on that if he wears a jacket, people take him more seriously. He's watched as longtime lobbyists register their opinions on a topic with a carefully timed roll of their eyes. And he's noticed that Holcombe talks about goals but steers clear of declarations, and he wonders if that's the mark of a political appointee being careful not to offend. "She doesn't come out and say what we ought to do," he said. "She's very good at not answering the questions." Pond hopes for a resolution to the nearly four-month-old FairPoint strike that put him out of work, but he's also riveted by where the education debate is headed. "It's a real gift to immerse myself in the political process," he said. "It'll be sad when I can't be there anymore."